There’s no shortage of good food no matter where you end up in Snowmass. On the mountain, you can’t do much better than Elk Camp (aspesnowmass.com) at the top of the Gondola. With huge windows reaching all the way up to the high ceiling, every seat in this market-style eatery provides a great view by which to enjoy the high-quality food served there, including a Kids Combo menu to encourage healthy eating. At the base of the mountain, the Base Camp Bar & Grill (basecampsnowmass.com)offers friendly and fast slopeside food service to get you fed and back on the hill, but beware of the over 30 hand-crafted Colorado beers on tap or in a bottle or lunch may turn into après. For a delicious fine-dining experience while still keeping a casual vibe, make reservations at The Artisan Restaurant at the Stonebridge Inn (destinationhotels.com/stonebridge-inn). Located between the Base Village and the Village Mall, its Executive Chef, Greg McDaniel, brings a delicious twist to familiar American dishes. 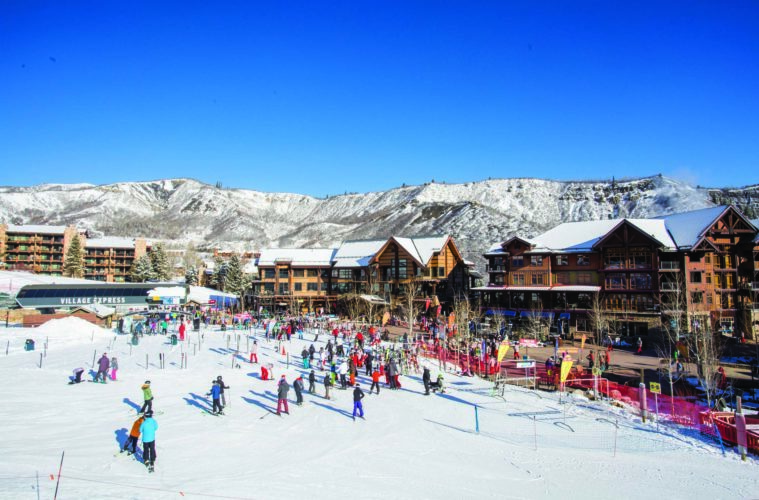 While there are lots of great lodging options right on the mountain, why not explore other nearby towns like Carbondale just 30 miles down the valley. The new Distillery Inn is located above the Marble Distillery (marbledistilling.com) and with only five rooms, it offers an intimate, quiet and luxuriously modern place to call home while exploring the Roaring Fork Valley. Each spacious room has a mood-setting gas fireplace, offers a balcony or patio and is built with and decorated using sustainable materials and hosts a King Size bed. On the mountain check out the new Limelight Hotel (limelighthotels.com) which just opened this season.